PIC JTAG, UART and GPIO is a breakout board + firmware for a PIC16F1454 to provide UART + JTAG + GPIO functionality in one 14-pin part that does not require a crystal. 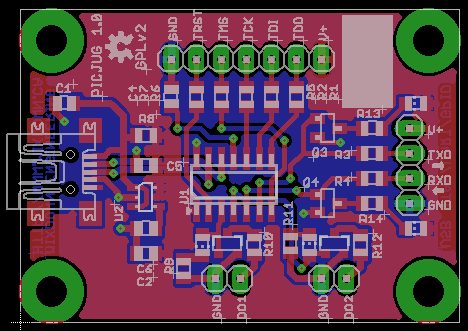 It is meant to replace the FTDI FT232 I usually drop into designs, since the FTDI part is more expensive and can’t do both UART and JTAG with one part. The GPIO was added mainly because I want the ability to hard-reset the target or maybe control a relay/larger FET to completely remove power from the target.